Pat Milam knows what it is like to bury a child. But it was not a gunman who murdered his son in October 2011. It was America’s failed mental health system, the still-grieving father says. Pat and Debbie Milam’s twenty-four year old son, Matthew, ended his own life eight days after he was discharged from a psychiatric ward in New Orleans, Louisiana, where he was being treated for bi-polar disorder and paranoid schizophrenia – although his parents have a difficult time actually calling what happened comprehensive “treatment.” Pat calls it “stabilize and release.” They claim Matthew was hustled through a system that did little to actually help their son while their repeatedly pleas for help were ignored. According to medical records the Milam’s now have, Matt’s primary psychiatrist noted that Matt was “at a high risk for suicide or other bad outcome” three months before his death. Pat says the doctor didn’t warn him or his wife about Matt being dangerous even though he was living with them in their home at the time. On June 14, 2011, Matt drove to an emergency room and told doctors that his “brain was leaking.” He demanded a brain scan. The scan failed to detect a lesion or leakage, but the doctors there noted in their report that Matt appeared to be paranoid and delusional. Matt even asked the doctors to prove they were really doctors. He was sent home without treatment. Pat sent Matt’s psychiatrist another note about this and again got no response- although the doctor did discuss the grave with Matt, Pat found out later in the medical records. A month later, Matt slashed his own throat while talking to his mother in the kitchen. He’d lost nearly two liters of blood by the time he was admitted into the hospital. He told doctors he’d hurt himself because “men in a black car” that drove past their house were after him. Matt stayed at the hospital in a locked ward a few days, took his meds, did better and was discharged back to his primary psych care physician. A few weeks after he was discharged, Matt’s primary psychiatrist noted in medical records after meeting with Matt that his “progress was bumpy.” The psychiatrist wrote that Matt remained an “extremely high… risk for suicide or other bad outcome.” But the doctor never communicated this to Pat and Debbie. Matt’s behavior turned violent shortly after the thunderstorm incident. This time, he broke a pair of scissors and threatened to “kill his parents and put their blood on the wall.” He accused his mother of being the devil. Pat called the police again. They came and talked to Matt. They left after he assured them that he’d calmed down. They thought Matt was throwing a fit because he wanted his parents to give him money to go to a school fair. It should be noted Pat owned guns and had removed them from the property years before. On Oct. 5th, Matt called home drunk and told his parents that someone had stolen his car. Pat suspected his son, who had a drug problem in the past but was now clean, had either traded the car for drugs or money or had given it away because he planned to kill himself. Pat admits that he was terrified about suicide, in part, because Matt’s younger brother had died from a drug overdose a few years earlier. He didn’t want to lose Matt too. Increasingly concerned about his son’s behavior, Pat decided to inspect his son’s bedroom when Matt left the house to take the family dog on a walk. Inside a closet, he found two gallon gasoline cans with petrol, large BBQ size propane tanks, flares, a propane torch, rat poison and a shotgun shell. Pat called the police again, and the police came to the home, but Pat was told there wasn’t anything illegal about storing flammables in a bedroom closet, as it was his home. The police had been to the home many times and were expressed concern about Matt’s mental condition, but told Pat there was nothing they could do but to “call if you have any more trouble”. Pat confronted Matt when he came home from his walk with the dog. He became angry and threw a portable phone at his father. The police were called again and this time they took Matt to a hospital emergency room where he was placed under a psychiatric hold (PEC) because of his behavior. Pat wanted doctors to realize how sick his son was so he began collecting evidence that his son was a danger to himself or others. Pat met with a family psychiatrist, and he wrote a letter stating that Pat was a credible parent and shouldn’t be dismissed as an alarmist. In the doctor’s “Matt needed long term care.” Pat also collected affidavits from Matt’s friends. One stated that Matt had shown him a “noose” that he had put around his neck. “This is how I am going to kill myself,” Matt was quoted as saying. Pat also took photos of the flammable explosive items in his son’s bedroom closet and hand-delivered them, along with a the family psychiatrist’s letter and the affidavits from Matt’s friends, to the hospital. He did this the very next day while his son was still being evaluated at the hospital. Pat even had the Jefferson Parish Coroners office involved to get their input to prevent an early discharge, and they agreed Matt should be kept past the 72 hour hold. Undeterred, Pat called the hospital official in charge of patient care and begged her to arrange a meeting for them with Matt’s doctors. “She replied HIPAA, HIPAA. I told her in no uncertain terms that ‘I did not need to discuss Matt’s medical condition, I know that!’ I told her I wanted to discuss with the doctors — any doctor — what we should be doing at home to help Matt when he was released, how to save our son.” Pat was told he would get a call back but never did. At that point, Pat contacted his local congressional representative to learn about HIPAA. He wanted to learn more about it’s restrictions and also wanted to make certain that he understood the ramifications of a PEC’s Psych patients rights as per HIPAA. The Congressman’s legal rep told them it was “unclear” as to whether or not the doctors could talk to Pat and Debbie since Matt had been committed.In short, not even the congressman understood the HIPAA law. Pat next sent a fax to the hospital’s CEO begging him to have someone talk to Pat and Debbie before Matt was discharged. Pat never got a response from the CEO’s office. While Pat was trying to tell hospital officials that his son was sick and going to kill himself, Matt was denying that he had a mental problem. According to the medical records, Matt insisted his parents were overreacting. When asked about the contents in his closet, Matt said that he understood why his parents were worried but he insisted that he wasn’t going to harm himself. He also told the doctors that he “didn’t believe mental illnesses were real”. Pat told them his son was still paranoid and having hallucinations in the Psych unit. “One of Matt’s friends had visited him two days before and Matt had complained FBI agents wearing invisible raincoats walking inside the hospital.” The doctors said they had not noticed that. 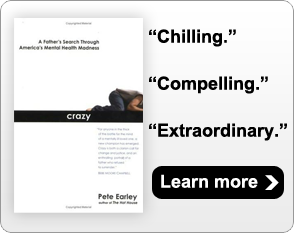 When Pat realized that no one was listening and that his son was going to be discharged, one way or the other, he asked the doctors to give his son a long-acting , injectable anti-psychotic drug that would keep him stable for at least thirty days. The doctors said they asked Matt but he refused. However, Matt did agree to outpatient treatment. Matt’s discharge plan called for him to attend a local treatment program. But when his mother drove him to the center, he balked, saying he was scared that the people inside were going to harm him and it was a “trap.” She coaxed him into the center but was told by the staff there that they couldn’t discuss anything about Matt’s treatment or if he participated in therapy. “HIPAA again. At home, he refused to take his medications, and the meds he had taken at the hospital were wearing off as was expected.” Pat recalls. Eight days after Matt was discharged, he offered to cook his father breakfast. After he fixed scrambled eggs, he announced that he was going upstairs to get ready for his out-patient therapy class. Before leaving the kitchen, Pat gave Matt a hug and told him “I love you”. Inside his bedroom, Matt opened the valves on the propane tanks, took the caps off the gas cans and fired a home made shotgun shell device killing himself. His father raced upstairs and found him dead. Pat tried CPR to no avail. Pat believes the doctor who discharged him “hoped” Matt was stable. But Pat thinks “this had more to do with insurance money than my son’s health.” Even though Matt was in the Psych unit in the same hospital in the same building as his primary long term psychiatric doctor, the medical records do not show Matt’s primary doctor was ever consulted. Why? Pat asks. The records are unclear to whether or not the Coroner’s office played a role in Matt’s discharge. Reading this makes me physically ill. Why does no one care? We must be louder. That is our children’s only hope. Stories like this are tragically common. I can hardly stand reading this because I know this world all too well. What needless suffering for Pat. Debbie and Matthew. HIPAA allows exceptions, but it’s used as a blanket legal shield–and in this case Matthew even signed a waver that was in his file. Sounds like negligence to me–what if they had never read an intake note that he was allergic to a medication? This woud be unbelieve except for the fact that it happens every day. What is the next move by a parent to make sure the adult child does not resort to violence to self or caregivers? The recent statement by the NRA that “The only way to stop a ‘bad man’ w a gun is a good man w a gun” is now being widely quoted in the media & is completely untrue! Preventative mental health treatment stops people who need help from becoming ‘bad’ long before they get to the point of getting a gun in desperation! We need a short, succinct way to say this. Thank you for such a persona, poignant article. Those with mental illness, are, by definition, the least able to manage their own care or medications. Those who love and care for them most are largely excluded from any information related to their care.For example, when a person who suffers from bipolar disorder is in a manic phase, they feel absolutely fabulous. They are not inclined to listen to anyone’s advice as they feel “on top of the world” for the most part. Additionally, HIPAA prevents medical personnel from releasing any information related to the medications being prescribed for the patient. This leaves them with an arsenal of upppers and downers and anti-psychotic medications with a whole host of side effects and interactions which no one has been asked to help monitor. The medications prescribed at one facility may be the very reason the same patient is checked into the next facility. Many of these patients, particularly when they are feeling manic, do not feel the need to take medication. If there are any oppositional-defiant tendencies, they do not want to share the information with those who love them. Sadly, most of these privacy measures are in place due to the discrimination in society against those who struggle with mental illness. Every family and person in America has had their lives touched by someone who struggles with mental illness. If we would open our eyes and our hearts, the stigma would disappear and the privacy measures become obsolete. Until then, there must be some mechanism whereby families and loved ones can obtain enough information and support regarding the ones for whom they care to be able to keep their loved ones and society safe. is horrible, horrible, horrible. And I can totally see this happening. companies for people who are being denied a medication they really need. but there is such huge need and not enough resources or time. Help!!!!! Very, very hard to read. My own son died by suicide in November 2008, 6 days after release from a psychiatric hospital. I did so many of the same things these parents did; Gave the treating doctors a copy of his suicide note, knowing it would only estrange me further from him; frantically called the hospital several times, and after his release, the mental health workers charged with his care, not understanding why he was being released in a clearly delusional and suicidal state. This was after 5 years tortured by illness, in and out of hospitals, and me desperately trying to get him the treatment he needed. Only another parent understands what these illnesses do to our intelligent, sweet, loving children. Even after four years, I am left in disbelief that in a great country of good people, this is how we treat our citizens, and their families who need our care so desperately. My only son’s mental illness is so burdensome to deal with, but we still have him and I am thankful for that as hard as it is! I remain hopeful that someday soon there will be increased understanding of mental illness with the promise of a cure around the corner! My wife and I are coordinators for our county’s NAMI affiliate and since we started in 2002, we have met so many wonderful people with stories similar to yours. I would encourage you to find a NAMI affiliate that is near if you don’t already belong. Families with loved ones like your son could benefit from hearing your story ! Julie, I wish you peace and comfort during these days that remind us that we SHOULD celebrate and be festive! I try to live one day at a time regardless of “special” days! Thank you, Bart, for your kind and thoughtful words. I will continue to try to tell as much of my son’s story as I am able. And I will continue to hold hope for your dear son, and for a better future for so many struggling loved ones. My thoughts are with you! Pat, Thank you for writing ..this is so very real. I got help only by pulling chain of command over governing personnel. They did not care about my son or I or family or society..only their jobs and my harrassment and potential litigation. I am so sorry for your loss …mental illness…is a sickness that needs healing and understanding. Pete Earley is a voice and you are also a voice. I am so sorry for your loss..so deeply deeply sorry; it’s not fair. Will be praying for you and your families often..A great letter of your thought..so sad it’s about Matthew. I also lost my son April 22, he died from smoking meth..he hated this stuff told me about it and the dealers got him hooked even after I told them he was ill and stay away. Not to detract from your story..but I do know the pain of loss, my son died in peace with joy..whereas Matthew did not..but I trust he will have his glory and peaceful times witih God in Heave..Matthew, an Angel…who suffered on earth from an illness we did not take care of..WE AS A SOCIETY NEED TO COME TOGETHER IN THIS..JUST LIKE HURRICANE SANDY AND SANDY HOOK. WE SHOULD HAVE BEEN THERE FOR YOUR SON BEFORE THIS HAPPENED. MY PRAYERS deep thoughts and hope are with you. I am so sorry, please remember the joy you shared with Matthew, the gift he gave you all on earth..his spirit..We Cannot Forget Matthew..and must fight for His Memory, for others that can know peace and not torment as Matthew did. This is not right that he did not get long-term rehabilitation and care..he has a 5150 in California,,even her the police have a tough time, but we have PERT teams..and San Diego new Mayor is addressing this matter.. Matthew’s story must live on for other! GOD BLESS YOU FOR HAVING THE TIME AND OPENESS TO SHARE YOUR STORY. Please have a Nice Christmas.. My Love and My Heart , my tears flow openly to you. We need to work together..All of Us, God Help Us to see the Light and do what is Right for the Mentally Ill in need of help! HIPAA has made it extremely difficult for caring family members to have a place/say in their loved ones’ behavioral health treatment. In my opinion, HIPAA is a misservice to many mentally ill persons instead of a helpful service. Yes, HIPAA can help an individual keep his/her medical information private for employment purposes but overall HIPAA has done more harm than good in the mental health field. Unfortunately, I could have written this article. I remember the first time my son (age 18) was discharged too early from his first in-patient stay. The only advice they had for me was to purchase ear phones for him so he could listen to music to drown out the voices! After five years of stuggling to get proper mental health treatment, my son agreed to participate in a study and get treatmnet at the NIMH. My son was inpatient there for six months, on a new medication and doing really well, we thought. Three days beofre he was set to come home for Christmas, he jumped from the seventh floor in the artrium of that hospital. No one saw it coming, not even some of the best doctors in the world. Like the parent in this arrticle, I did everything I could to try to help my son, and like the parent in this article, his story ends in tragedy. Mental health recovery is possible, but horrific stories like ours will continue until the stigma of mental illness is erased and family members are allowed to participate in the treatment team’s plan. I am SO SORRY for your loss, and ask GOD to grant you courage to tell your story as often and to as many as you can, comfort in your sadness, strength to get through these difficult days and grace to accomplish all of the above! My wife and I have a son with a major mental illness. He has told us so many times that living here on this earth is like being in hell for him. He has attempted suicide in the past and we know that is a likely outcome that our loved ones choose to escape the unbearable pain that they feel inside and out! To add insult to injury, there are so many in society who do nothing to help the situation to improve for consumers or their caregivers! PLEASE keep telling your story to as many people who will listen. We have kept mental illness tucked neatly away in the attic for FAR TOO LONG!!! This story has me in tears. Our son is 15 and has bipolar with pervasive psychosis. We have talked about getting guardianship or medical power of attorney when he turns 18. I know many of these victims had an onset at a much later age and therefore that probably was not likely to happen. But I hope it helps us as our son turns 18. Bless all of those children who had such torture in their minds that they felt suicide was their only escape. And I can’t imagine how sad and angry those parents must be. So sorry, Beth. There is so much reason to hope for a better outcome for your son. Try your best to not live in the fear, and hang on to hope. We, who know what it’s like, will hang onto hope for you! I have a son with Schizophrenia. It is devastating to see the person he is now compared to the person he once was. It is a terrible illness. It keeps getting worse. Please know that your son is healthy now. He is in a place where he lives without mental illness. His pain is gone. I pray that eventually a medication or combination of medicines will help my son to live more normally. He has not been stable for almost two years. It is so tragic. I am so sorry for your loss. I too have a 24yr old son who was diagnosed with Schizophrenia at age 18 when he removed his left eye with a steak knife. He told the doctors that the voices commanded him to. And was chanting the scripture “If thine eye offends thee, pluck it out”. For the last 6 yrs I have tried everything from participating in discharge planning (while they allowed me to), obtaining guardianship (which I couldn’t get 2 doctors signatures & my son refused), begging social workers and doctors to allow him to stay longer than the 3 days. My son lived with me and I would give him his medications daily. I knew when he “cheeked” them, because he would soon have another manic episode. Standing on street corners in all white with a bible preaching telling people he was Jesus. (Police told me he wasn’t hurting anyone), refusing to eat any food unless it was fast food (he believed my cooking was poison) taking 8-10 baths a day (the bible states cleanliness is next to Godliness) is what he told me. So many bizarre actions that I talked over and over with his psychiatrists. It got me nowhere. On Aug 4th, 2012 he was admitted for suicidal thoughts, he stayed 2 weeks and was sent home. After 5 days home, he was re-admitted for the same thing. Again, another 2 weeks and sent home. 2 days later I had to call the police to have him forced into the hospital, he was very manic. They kept him another 2 weeks. (Mind you this was 3 different Private psychiatric hospitals) they called me and said “he’s stable, come pick him up”. Upon arriving, I knew immediately that they were mistaken, he was definitely not ready. We drove home (about 10 min drive), came in the house, and within 30 minutes he ran into the kitchen, grabbed the largest knife out of the butcher block, and brutally started stabbing my 18 yr old son who was lying on the floor watching TV. I fought him off when I heard the screams, and was somehow able to get him outside for neighbors to call 911. My 18 yr old was stabbed 35 times, had a collapsed lung, and lacerated liver.My 24yr old sat in the driveway yelling “I got my soul back, now Satan leave me”.I explained to the police although my 18 yr old was on his way to the hospital that he needed psychiatric help. They took him to jail where he has been on suicide watch for all but 2 weeks of the last 3 months. I am in absolute turmoil. My 18 yr old and I have been in therapy weekly, I still have nightmares of the day. When I say I have become an Advocate and will do whatever it takes and speak to whomever necessary to help not only my son but others who may be in this same situation, until I am completely out of breath. My son used to be a loving, caring, highly intelligent young man. Always received straight A’s, worked part time jobs in high school, signed up to go to the marines, and even attempted college after his diagnoses. He did not ask for this disease. Everybody wants a normal life. A spouse, job, car, travel. Just live however we all choose. What can we do to ensure that they have that chance? Don’t they deserve it? I Love my son with all my heart. His brother loves him and holds nothing against him. I am a praying woman and I believe in God. I know his will will be done. Margaret, my heart is broken for you. Just look at these responses to this one parent’s horrendous story, and the fact that we can relate so vividly with our own horrendous stories speaks volumes to the state of care of our most vulnerable and suffering citizens, who just happen to be the children we love and cherish and would trade our lives for. So much of what your son has done and suffered is so similar to my own son’s. So much. In my case, my son died by suicide. Your situation is the other nightmare I feared daily; that he would end up in prison, hurting someone without understanding, and without meaningful treatment or a chance to be well and live a life. And because, unless one actually sees how these serious illnesses can cause a normally gentle, kind, loving person, to respond in bizarre, sometimes violent ways in an attempt to survive the war zone in their own head, I’m not sure anyone besides us, will ever understand or care what happens to them. Why is it that people can believe that every other part of the body can become ill, but not the brain? Unfortunately, the fact that a brain illness can result in terrible changes in behavior is too uncomfortable and complicated for people to wrap their heads around. So we’re left out here on our own, so many of us, living nightmares that we thought we lived in isolation. The fact that I am not alone, and that another’s child, and family, is suffering as mine did is no comfort at all. I don’t know what to say. I’m just so, so sorry. Thank you Julie. We have to bring this to national forefront. We have to ban together in signing petitions and writing letters, to our Congressmen, and even the President. I have seen some out there on different websites that I have signed and sent them to my friends on changes that need to be made in Legislation. Stop all the stigma, start treating this disease as such, a disease. We need national attention for change, now. Not when tragedies strike. Our children need medical/ psychiatric help not JAIL. HIPAA is being used as an excuse to be lazy and to say “no” by people who don’t want to deal with problem situations. I’ve experienced this problem as well when my mother disappeared without explanation and I found out later she had been committed to a mental hospital. This father did everything he could and he can take some comfort in that. The medical professionals who did not coordinate care and ignored the form allowing release of information should be sued so that this travesty doesn’t happen again. The heartbreaker in all these stories is that nothing seems to change! My son Brian’s story is so much the same as Matt’s although Brian took his life in 1999. Doctors and other professionals repeatedly told me that I was “over-mothering” my son. I was asked if I had considered medication for my anxieties! He was told he was “depressed” due to his parents’ divorce. Shortly before he died at age 21, he was diagnosed as schizo-affective but was noncompliant for meds. I actually did try to justify giving his medication in his food and still wish I could have found a way to save him. It has taken me all these years to cope with the disintegration of my brilliant, beautiful and amazing child. I finally wrote “Schizophrenia: Evolving from My Son’s Suicide to the Classroom” which includes many of Brian’s own notes and poems that he sought to publish. Teaching special needs children and writing help keep my own sanity in advocating and fighting for the rights of our children. My heart goes out to Matt’s parents for the loss of their son and to all the families that continue advocating for the rights of their children. Sadly, it seems to take such terrible tragedies in the news to even get the attention of our legal, medical and educational systems. Jean – The night before my son took his life in 2008, I, too, was asked if I needed medication for my anxiety when I frantically called the Assertive Community Treatment team he had had for less then a week, explaining how depressed and delusional he was. I’m so sorry for the loss of your precious boy as well. Where can your book be found? I have just recently lost my son who died by suicide also. I am extremely sorry for everyones loss. He was eighteen and suffered from OCD and depression. He attended counselling sessions which he said initially he wanted to do alone so I gave him that privacy as I didn’t want him to hold back in any way. I was hoping to attend with him at a later date when he felt more comfortable! I waiting for his permission! He was also given Fluoxitine which I did not agree with but had no power to anything about due to his age. He assured me he was taking his medication correctly but he was not. I cannot understand after his initial assessment why I wasn’t called in to discuss his illlness as I never realised he was such a risk to himself. He had threatened suicide months before and was taken to a psychiatric unit and was released the following day. I was given no information other then where he had been taken. He assured me it was an attention thing and it would never happen again very convincingly. How can they not have known he was so ill as supposed professionals? Why would no one tell me anything? In these types of circumstances it’s imperative not only to the suffer but also to the family members that live in the same household or otherwise. I could have prevented this happening if I had been kept more informed!!!!!!!!! Please excuse some missed words.